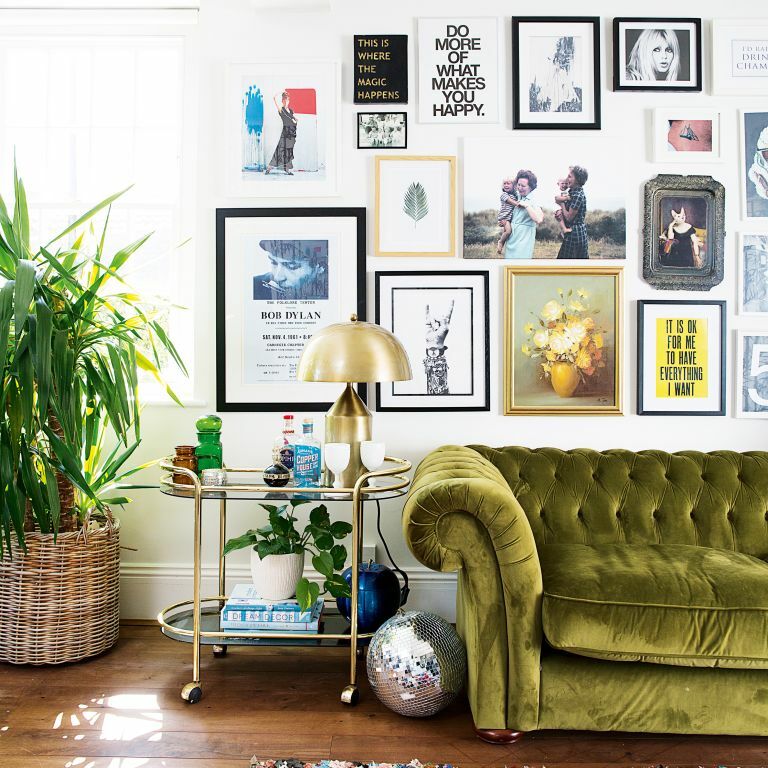 A gallery wall is one of those fab design ideas that can quickly transform any room – as shown in this wonderful space in stylist Lisa Dawson's home (above). If you are renting or like to change your décor a lot, they also have the benefit of offering a transient way to add personality to your home – something that can change as your tastes do, or as your art collection grows. What's more, you don't need to spend a lot of money to create a gallery wall. Most of us can't afford large, expensive pieces, but grouping a number of affordable prints, postcards and charity shop bargains can have as much impact. There are no hard and fast rules on creating the perfect design, but here are our top tips for hanging a gallery wall of your own, some from our favourite Instagrammers. Check our hub page for more design tips and advice. Plus, we've got tons more gallery wall design ideas and ideas for displaying photos and artwork, too. Mixing witty typography, photos, modern prints and faux (or real) old masters is an easy way to create a gallery wall that can grow, be swapped/changed/moved, and will work with a wider range of artwork. Plan out the pattern on the floor before you begin banging in nails. You can then get a large piece of brown paper (not got a big roll? Tape a few together), place your pics on top and draw round them. Locate where the hanger will be positioned and then tape this to the wall and hammer in your picture hooks or nails. Remove the paper and hang your prints – job done! Either use the biggest artwork as the centrepiece and hang around it, or start from the bottom corner of the wall and work along and upwards, arranging them in the most eye-pleasing arrangement. The latter works well if you are hanging on a staircase but try to work around an imaginary line that follows the gradient of the steps. The frame is not merely a vessel for the artwork – oh no – it is another chance to add interest to the wall. Go ornate, go chunky, go brightly coloured. And frames don't have to be pricey either. Pick up a load of old pictures from your local charity shop. You can paint the frames with spray paint or chalk paint to get the look you want. For a super easy gallery wall, invest in a pack of pegs or bull dog clips. These can be fixed to the wall, or for an even more versatile (and easier) option, hang wire or string across the wall and peg your prints to that – think of it like an arty clothes line. Want even more impact? Follow the tip above, but instead of using wire hang your pictures from a string of fairy lights instead. No hammer? No problem. Grab yourself a roll of Washi Tape and tape your prints to the wall. It is the quickest, easiest and cheapest way to make a gallery wall and definitely won't upset your landlord like a bunch of holes in the wall might. If you are renting, you will want a damage-free way to hang your art – and even if you don't rent, you are probably wary of hitting a wire or pipe. So, instead of nails and picture hooks, use Command™ Strips. These stick to the wall and have a velcro face that can be stuck to the back of a picture frame for super-quick, mess-free gallery walls. They won't leave any residue on the wall either. The large Command™ Strips can hold as much as 7.2kg and cost less that £5 for four pairs. A gallery wall can look disjointed if you have irregular spacing between the pictures, so use a book spine, ruler or anything you have to hand to mark a set width between the tops, bottoms and sides of all your pictures. Even if your pictures are lots of different sizes, this method helps them look evenly arranged. Marquee lights, plates, mirrors, 3D letters and wall-hung ornaments all make quirky additions to a gallery wall. If you collect something unusual this is the perfect way to put it on display – we have seen collections of fans, masks and even old wooden tennis rackets displayed this way.